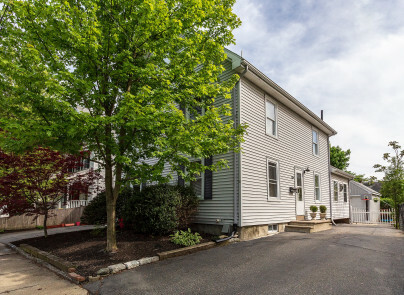 Just minutes away from downtown Winchester and its amenities including; shopping, the Farmer's Market, library, schools, parks, and commuter rail. Kitchen offers maple cabinets and gleaming granite counters. Family room is a great space with gas stove for winter, perfect to entertain or could be used as a playroom . The unique bedroom set-up allows for privacy, with a bedroom and bathroom on both the second and third floor. Hardwood floors and replacement windows throughout. Ample storage in basement and large storage shed. This condo features a private, fenced, Beacon Hill-style backyard. Move right in and enjoy all that Winchester has to offer!